Dominique Brasseur always said to herself she’d use her retirement for long travels on foot. 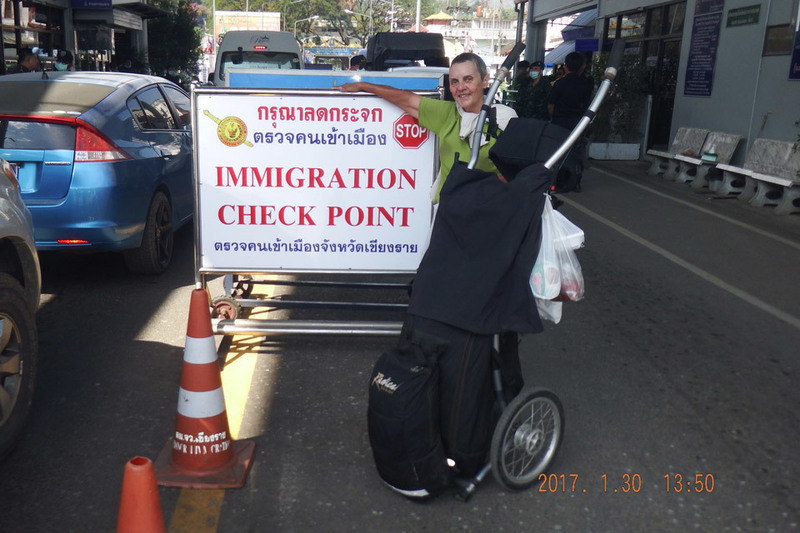 At 65, she joined her son Nicolas on a south-north crossing of Thailand. They started in Betong, the southernmost frontier town, and walked some 3000km, taking their time to visit the country, to arrive on Monday, January 30, 2017 at 1.50 pm at Mae Sai checkpoint border, the official northernmost point of the border with Myanmar (ex-Burma), several months after they had set out. Dominique Brasseur: My shoulders not being up to carrying a backpack anymore, I could not have realized this dream without the Wheelie hiking trailer. I am grateful to the Radical Design Team for their material and advice before my departure. Back in Bangkok by public transport, we are now continuing our journey on foot to Cambodia. The travel continues, what a pleasure.